Inder Loves Folk Art: Space Jams. Here is another project I made a while ago, but took forever to photograph and blog. When Laura Tichener at Craftstorming asked me to test the larger size of her Fancy Pants Leggings pattern, I was totally down! I love this pattern and I had been hoping she would increase the size range. 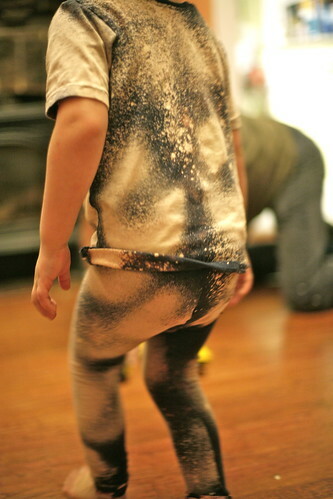 Joe told me a while back he wanted "space PJs." I wasn't sure how I was going to pull this off, until I remembered Small + Friendly's Galaxy Jams. 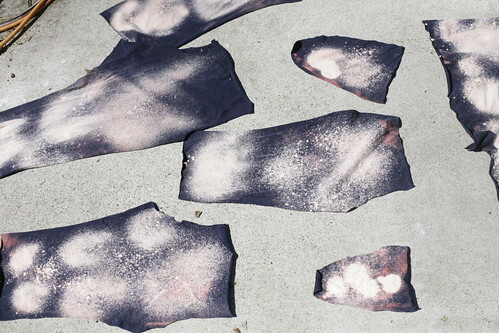 She had sprayed dark fabric with bleach and sparkle paint to create a beautiful "galaxy" effect. Cool! I cut out Fancy Pants for both Joe and Maggie, and a Flashback Skinny Tee for Joe. 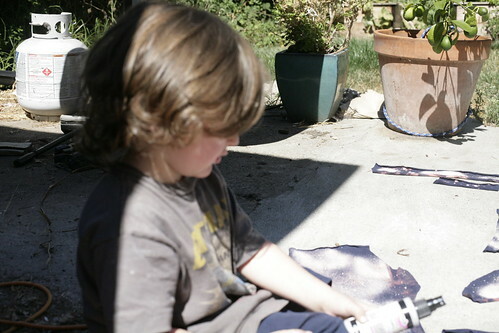 Then I enlisted Joe's help with prepping the fabric. I made Joe put on gloves and let him help with spraying bleach on the fabric. 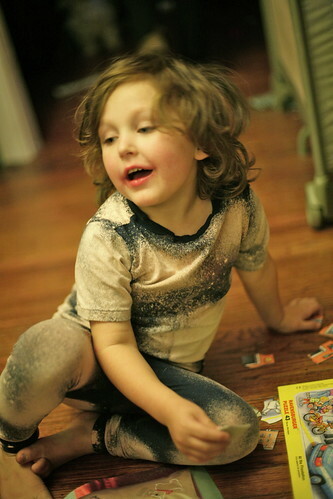 But he was a bit enthusiastic with the bleach, and the end results are admittedly less "galaxy" and more "acid washed." Haha. But he was excited about his PJs, and that's what counts. 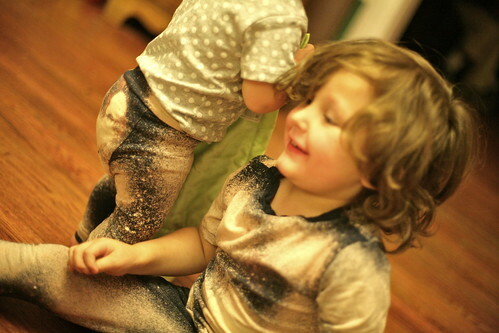 The sparkle paint doesn't photograph well, but Joe was quite generous with that too, so these PJs have a subtle all-over glitter. 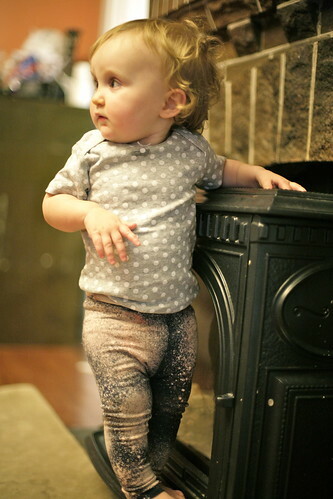 These are size 5T fancy pants, and they are pretty snug on Joe even in this very stretchy cotton lycra. I exchanged some emails with Laura about this - if I wanted to sew these up in a less stretchy knit, I'd probably slash and widen the pants a bit (Laura provides a handy "widen" line just for this purpose). Joe is a pretty stocky, solid guy. And it's always fun to match your sister! Here she is, going vertical as usual. 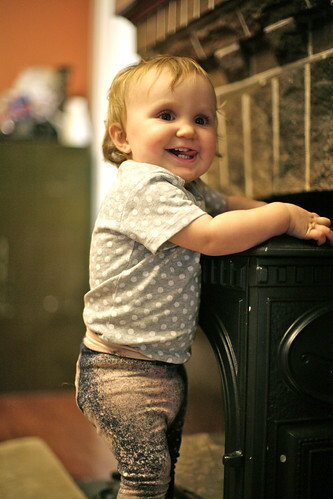 Maggie treats our fireplace as her own personal rock wall! This girl loves to go vertical. She's going to be sad when we have to turn on the heater and block off her climbing area. Who says matching outfits only work for siblings of the same gender? Joe gets a big kick out of matching his little sister. They look like a couple of acid-washed 80s rockers (Joe's working on his hair-band hair, too)! 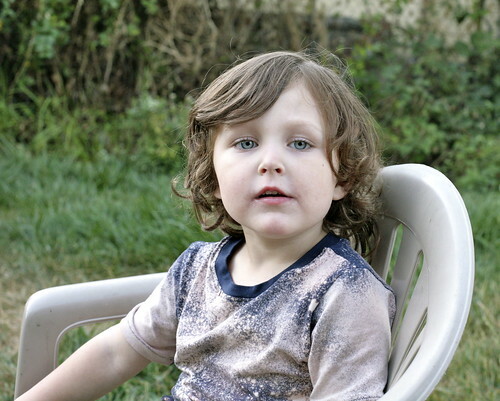 Joe has been wearing this shirt frequently - pretty much every time it is clean, and usually for a couple days straight! It's his new favorite! Making clothes with Joe is the best. Awesome! I love it! I better not show Jude this or he'll demand a shirt! Hooray for matching! So awesome and it makes it even cooler that he helped design them! I love his hair!! i love the way you are so willing to jump in and try new things. it's really cool that you include Joe, too. i adore that last photo of him so much. those eyes! They look fantastic Inder. I love how you involve Joe so much in your projects. Thanks so much for all your help with testing. I'm definitely getting an urge to make my two some matching pjs soon.